For decades, we’ve been told that juice is an essential part of a good breakfast. Juice certainly has helped make Cathedral Prep football healthy over the last two years — the Ramblers’ offense averaged better than 400 yards in 2016 and scoring 80 touchdowns en route to a 14-0 record and a PIAA Class 4A title. Now James Franklin and defending Big Ten champion Penn State are hoping to pour it on to their conference opponents in the years to come by adding a generous portion of “Juice” to their program. Fredrick “Juice” Scruggs, that is. The Nittany Lions continued to try to squeeze every last drop from their 2018 recruiting class when they got Scruggs, the state’s consensus No. 1 offensive lineman and a four-star prospect, to pick them over Big Ten rival Ohio State on Friday afternoon. Scruggs is the 21st recruit in a class expected to finish with 24 or 25 signees. The Lions’ class currently is rated in the national top five by every major recruiting service. The 6-foot-3, 273-pound Scruggs is the fourth offensive lineman in Penn State’s class, joining tackles Nana Asiedu, Antwan Reed and Bryce Effner. Scruggs projects to the interior of the line, however — 247Sports ranks him as the No. 2 center in the class, but he also projects as a guard according to some scouts. Scruggs was effective both in the run and pass games last fall as Cathedral Prep netted more than 200 yards in both aspects, eventually beating Imhotep Charter and Penn State 2018 four-star safety recruit Isheem Young in the state finals. Michigan, LSU, Michigan State, UCLA and North Carolina were among the other big-time colleges in the hunt for Scruggs. An Ashtabula, Ohio native, though, Scruggs was considered to be leaning to Ohio State, his reported childhood favorite, until recently. 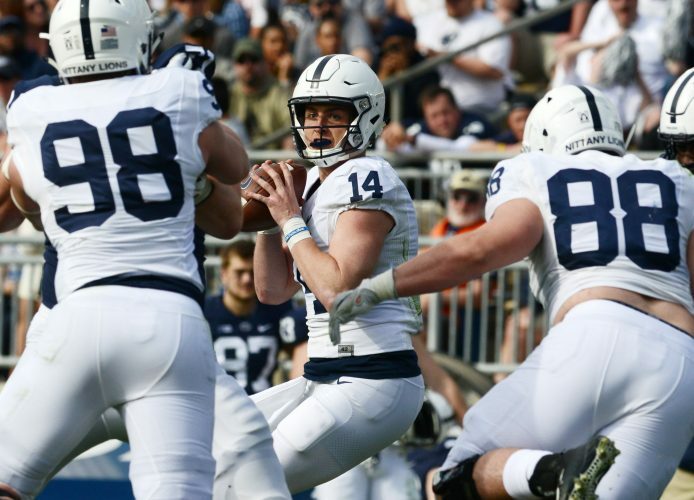 Penn State recruiting fans, in fact, had become pessimistic about their chances after he missed a couple of opportunities to make visits to University Park. Scruggs, though, had been considered a prime target for the Lions since he burst onto the varsity scene two years ago. The Ramblers are 28-2 with him in the lineup. Scruggs joins Mercyhurst Prep linebacker Jesse Luketa as the second player from Erie to verbally commit for this Lion class. Penn State might further bolster the line in the coming weeks, with Maryland four-star tackle Rasheed Walker expected to wind up a Nittany Lion. Penn State quickly is running out of open spots in this recruiting cycle. The Lions also are considered the team to beat for Cincinnati defensive tackle Aeneas Hawkins, son of Johnstown’s Artrell Hawkins, and are at or near the top of the list for Maryland defensive tackle P.J. Mustipher, New Jersey defensive end Jayson Oweh, New Jersey receiver Jahan Dotson and Arizona wideout Solomon Enis, the son of former Lion star Curtis Enis. In addition, wide receiver commit Shaquon Anderson-Butts told PennLive.com in an article that appeared Friday that he was working on his Harrisburg High School teammate Micah Parsons, considered one of the top 10 players in this year’s class. He said he expected Parsons to become a Nittany Lion, too.